Teapot Tuesday and Blog Win! I recently visited a blog hop sponsored by Our Daily Bread Designs for their February release -- mainly because I wanted to see what the design team did with the ocean stamp, which I thought was outstanding. I figured I might as well throw my hat in the ring, so to speak, and commented on all the blogs -- maybe I'd win something. Well, what do you know -- I won the whole release, all three sets. Doing the happy dance here!!! This week's Teapot Tuesday destination is South Carolina, where Robin, another teapotter, lives. Her husband recently died suddenly. If you'd like more information, here's the link to this week's tea party. Cindy related that Robin would one day like to have a condo on the beach, so I thought my newly-acquired ocean stamp would be perfect. Maybe this would be what she might see while sitting in her condo. I don't know if you can drive on the beach in South Carolina, but here in Florida (particularly in Daytona Beach) cars drive up and down the beach all the time. That is Robin's yellow Mustang there on the sand! 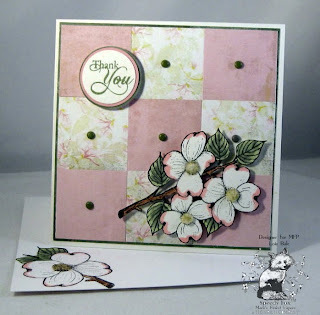 I recently attended StampFest By the Bay in Clearwater, Florida, with my sister. I love looking at all the new and fun tools at these shows. 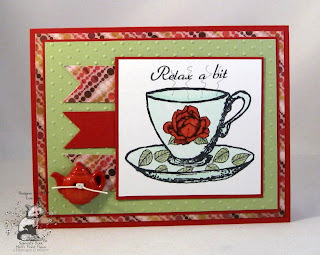 I found a wonderful lattice die from Cheery Lynn Designs in one of the booths and decided to use it on my Inspiration Challenge card this morning. The site that Stef chose was suggested by a fellow stamper Arleen Yee, a Canadian stamper who goes by the name of Arlybeans. The site shows a wealth of beautiful, handmade Canadian crafts. 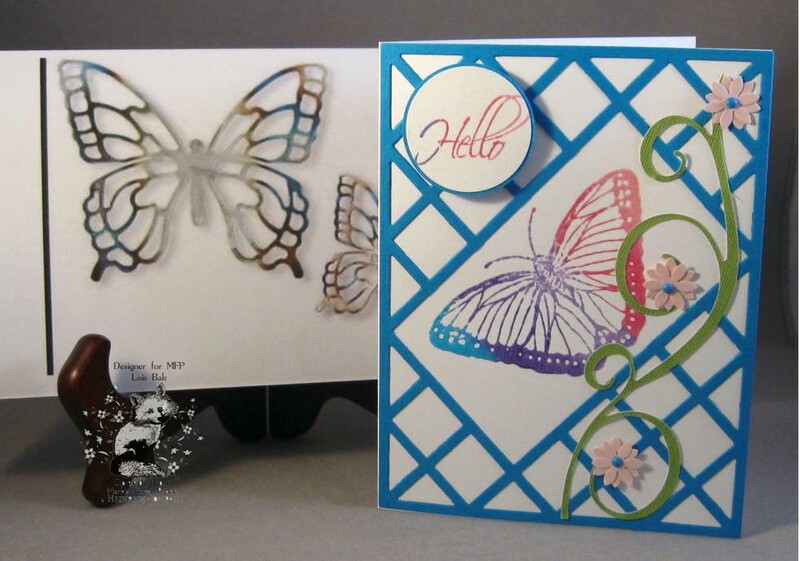 I chose one of the metal pieces -- the metal butterflies pictured behind my card. After I cut out the latticework with my Cuttlebug, I removed a section of the frame, glued it onto my white card base, and stamped the butterfly with some kaleidoscope ink. 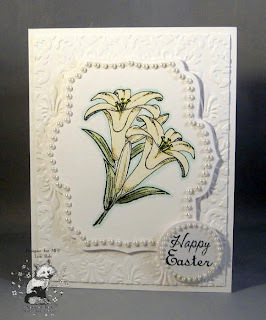 Then I added a bit of "foliage" which was made from a Sizzix "border" die and DCWV border punch strips and punched flowers. 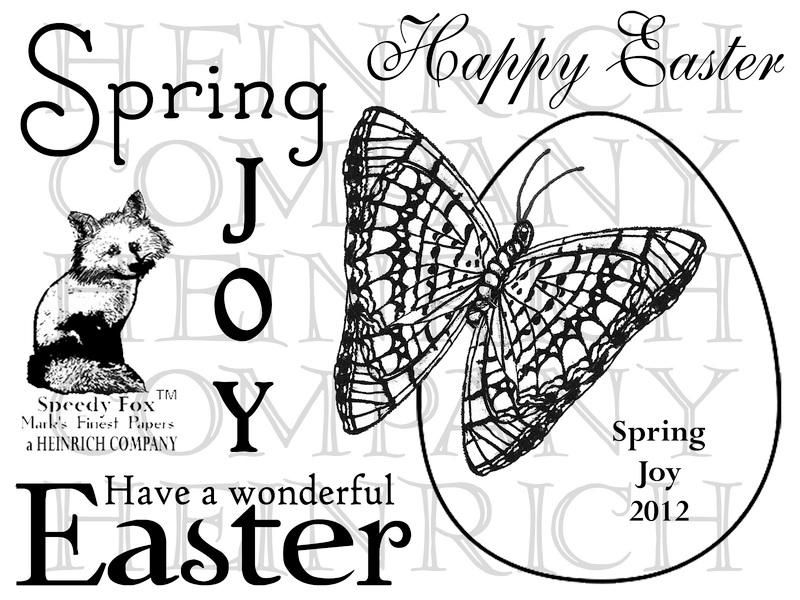 Both the butterfly and the sentiment are from a Mark's Finest Papers, a Heinrich Company set called Hello Butterflies. This is Shirley's last week as hostess for the CCEE challenges, and she chose a good one for today. 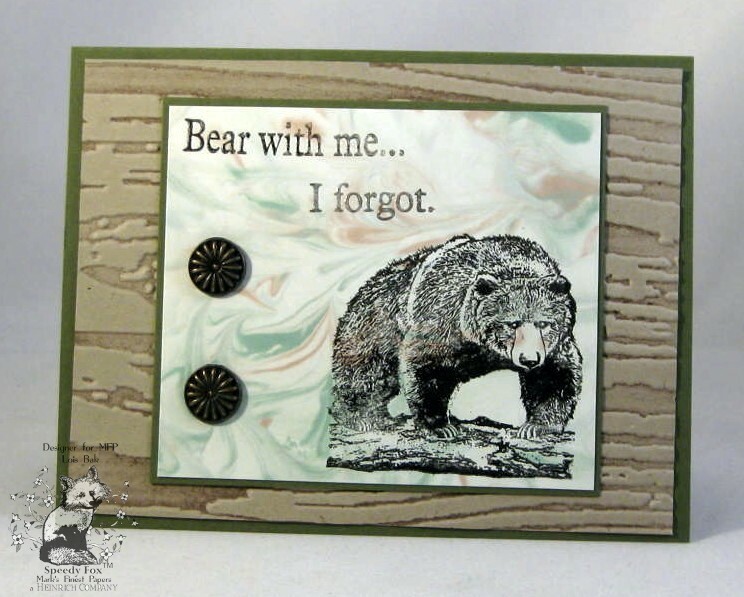 We were to get wild and make a card with a zoo animal. My choices were somewhat limited by my stamp inventory, but I did have a bear. And I don't think any of the other CCEEers chose a bear! The only coloring I did on my card was the log on which he's standing. 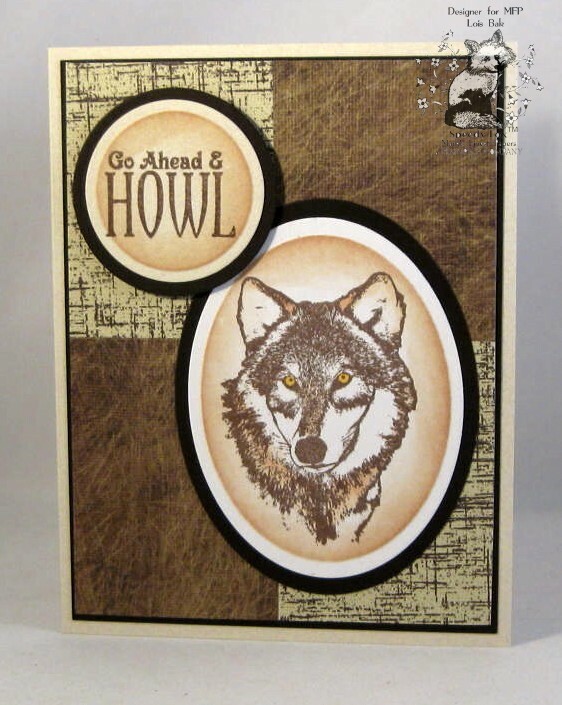 I'm in need of some masculine birthday cards in my stash, so this should work. 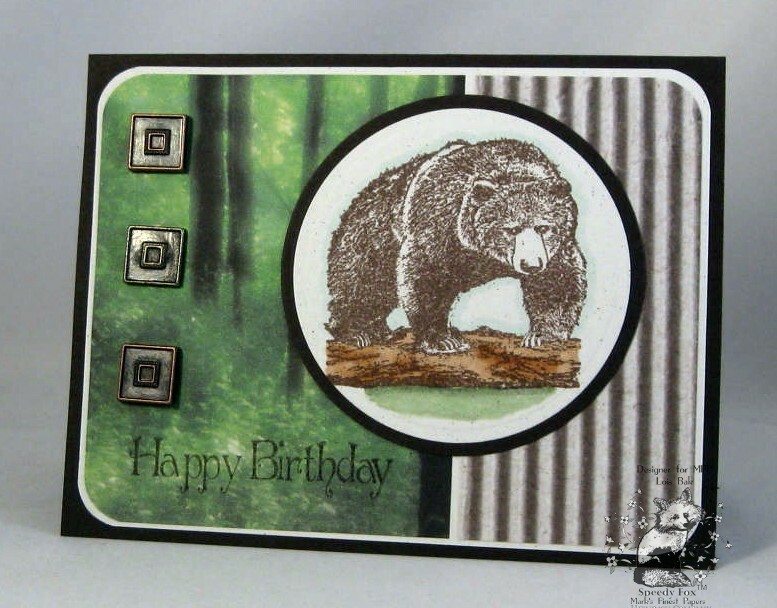 The design for this card came from Page Maps, a favorite sketch site of mine; and the DP came from a 12x12 DCWV Photo Stack. Fortunately, my printer has an enlarge/reduce feature because I had to reduce the scale of the trees and experimented with several percentages until I decided that 40% would work. Hello! 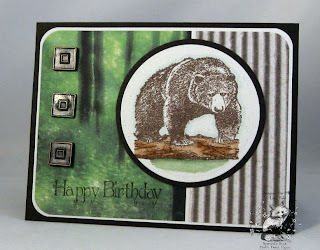 Welcome to the final day of Mark's Finest Papers a Heinrich Company's February Blog Hop! Please hop along with us! You have a chance to win one of the above stamp sets! Just comment on the design team members' blogs (don't forget this one), each day for more chances to win! (You do NOT have to comment on all the blogs each day! The names are drawn randomly!) All four winners will be announced on February 18, 2012 on the Mark's Finest Papers blog. You can go back and comment if you missed a day. (HINT: The more you comment, the more chances you have to win and comments on the MFP blog count twice!) The deadline for commenting is 11PM EST on Friday February 17, 2012. Two of my favorite techniques are masking and reverse masking, so I combined them for my first card. 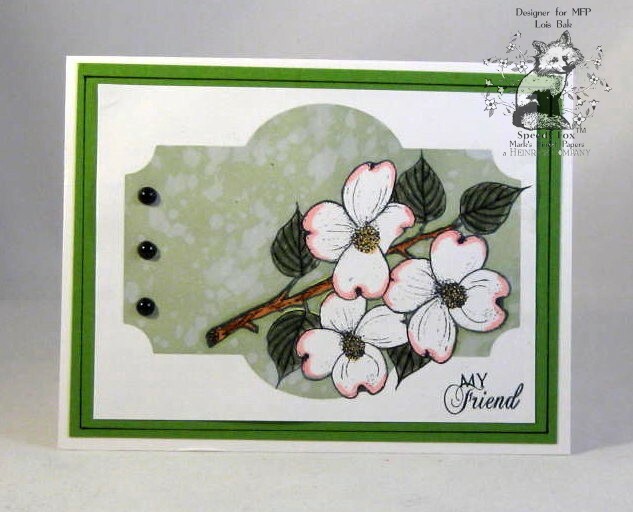 I stamped the dogwoods, masked them with another image cut from Eclipse tape; then I used the negative of a Labels Twenty-One diecut and laid it on my card before I sponged with the green. For my second card I actually CASEd a card from the Technique Junkies newsletter, using the technique Framed Embossing. As you can see, the green background inside the frame is embossed with a Swiss Dots embossing folder. Please hop along with us! You have a chance to win one of the above stamp sets! Just comment on the DT blogs (don't forget this one), each day for more chances to win! (You do NOT have to comment on all the blogs each day! The names are drawn randomly!) 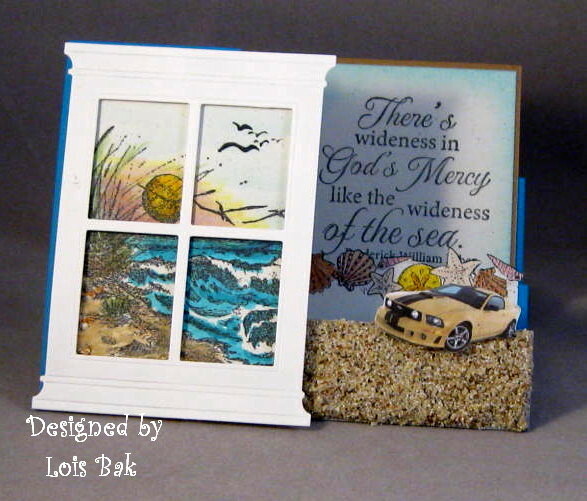 All four winners will be announced on February 18, 2012 on the Mark's Finest Papers blog. You can go back and comment if you missed a day. (HINT: The more you comment, the more chances you have to win and comments on the MFP blog count twice!) The deadline for commenting is 11PM EST on Friday February 17, 2012. My first card is also for the CCEE challenge that Shirley gave us this week -- white-on-white, with maybe a little color on the image. Have you tried those Want2Scrap nestablings? There are shapes that match many of the Spellbinders dies -- in both pearls and rhinestones. 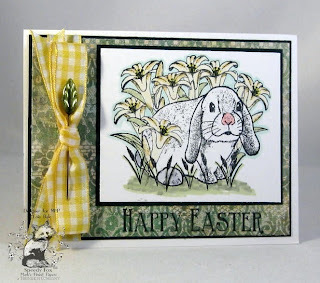 Both of my cards today are Easter cards. 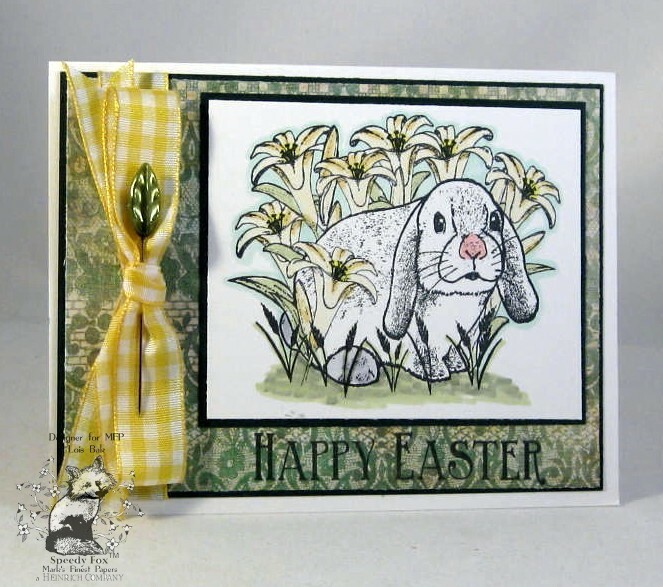 This bunny doesn't need much coloring, just a little pink on his nose -- so my only coloring is on the lilies and the ground. To dress it up a bit, I added the gingham ribbon and stickpin. Please hop along with us! You have a chance to win one of the above stamp sets! Just comment on all the blogs (don't forget this one), each day for more chances to win! (You do NOT have to comment on each blog each day! The names are drawn randomly!) All four winners will be announced on February 18, 2012 on the Mark's Finest Papers blog. You can go back and comment if you missed a day. (HINT: The more you comment, the more chances you have to win and comments on the MFP blog count twice!) The deadline for commenting is 11PM EST on Friday February 17, 2012. 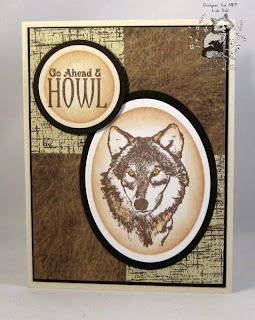 The first time I stamped this wolf, I decided that you didn't need to add much color to him -- maybe just a little grey or brown to soften the lines -- and, of course, those eyes! I was playing around with the shaving cream technique the other day and thought it would make a wonderful background for that bear, which is almost a silhouette. I decided not to color him either! Please hop along with us! You have a chance to win one of the above stamp sets! Just comment on all the blogs (don't forget this one), each day for more chances to win! (You do NOT have to comment on all the blogs each day! The names are drawn randomly!) All four winners will be announced on February 18, 2012 on the Mark's Finest Papers blog. You can go back and comment if you missed a day. (HINT: The more you comment, the more chances you have to win and comments on the MFP blog count twice!) The deadline for commenting is 11PM EST on Friday February 17, 2012. I found the layout for my first card at Page Maps, which I use quite often. And that cute teapot button was in a bag full of red and green buttons I bought at Christmas. 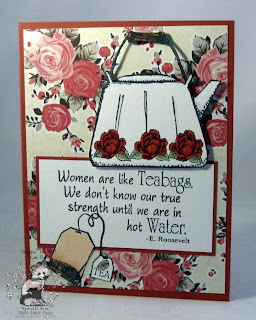 The quote by Eleanor Roosevelt on my second card is so true. 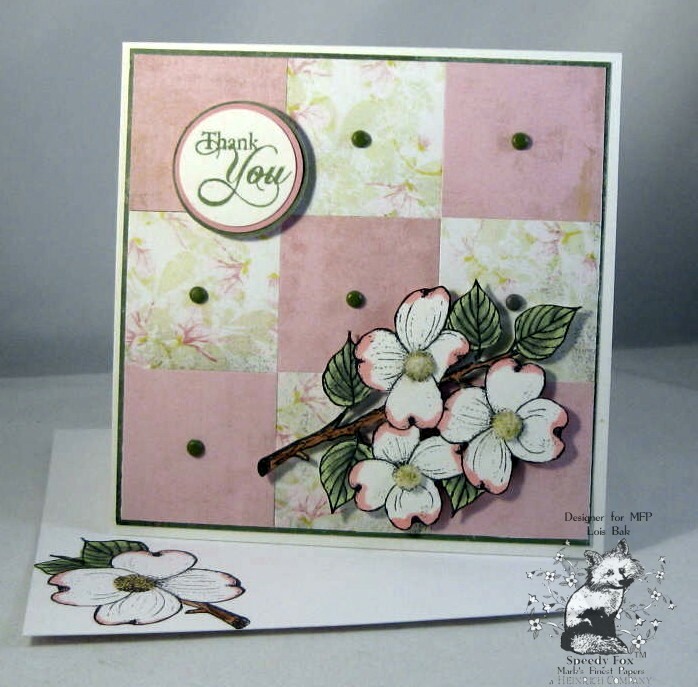 Shirley Quarry asked the CCEE team to make a card using a favorite sketch and dress it up with brads. One of my favorite layouts is color blocking nine shapes -- either squares or circles. I cut nine squares just short of 1 3/4" square from Basic Grey's Sultry designer paper and glued them down in alternating colors, mounted on a darker green piece from the same paper pad. I added a small green brad to the centers. 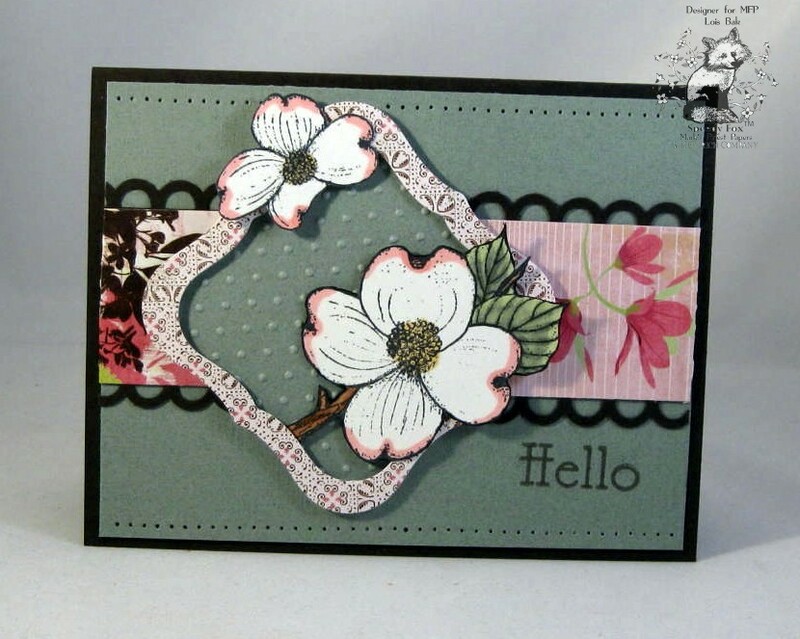 I have always loved dogwoods. We had two beautiful dogwood trees in our yard when I was growing up in Bucks County, Pennsylvania. The dogwood images on my card are from a soon-to-be-released set from Mark's Finest Papers, a Heinrich Company, called, appropriately enough, Dogwood Blossoms. I colored the image with Copic markers and added some Ultrafine Flower Soft in a mixture of Sand and Sage in the centers. After cutting out the image, I popped it up with Pop Dots and added the sentiment. I stamped the larger dogwood blossom onto the envelope. 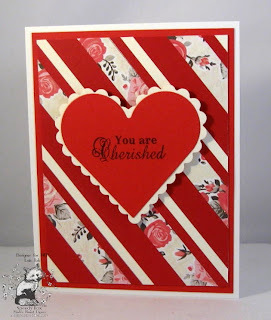 Today's challenge on Splitcoaststampers was to make your own stripes. 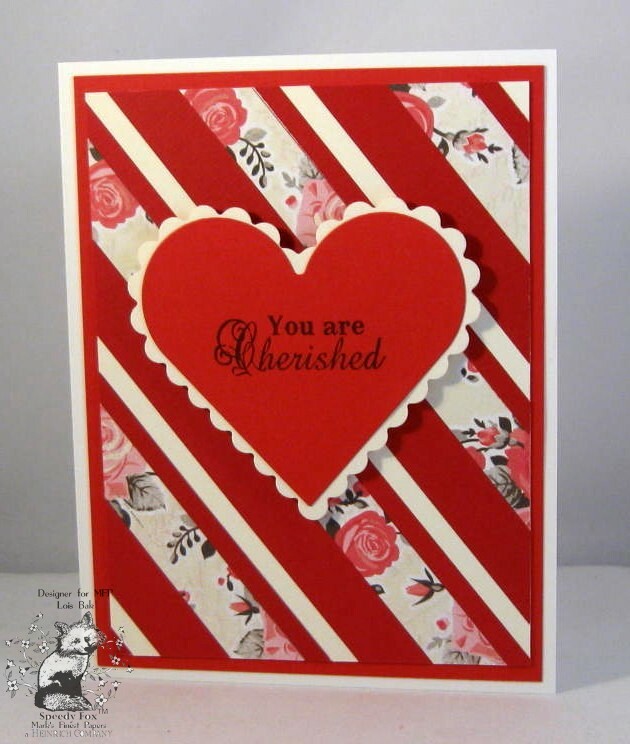 What a great way to use up those scrap pieces of cardstock and DP you've saved! As Valentine's Day is right around the corner, I used some red and vanilla cardstock and teamed it up with some pretty rose designer paper, cutting them into 1/8" and 1/2" strips. 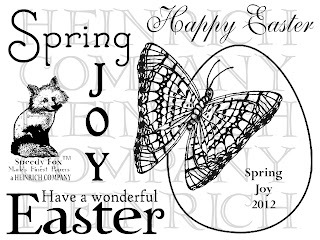 I was going to use an image inside my heart diecut, but I decided that it would be much too busy, so I just stamped a sentiment from Mark's Finest Papers, a Heinrich Company's set You Are Cherished. I think this was a much better choice. Shirley Quarry is the CCEE hostess for February. Her first challenge for the month is to make a card with a snowman and add some scallops. I live in Florida -- we don't have many snowmen here! Several years ago, I bought some templates for different shaped cards. One of the templates was for Winter Notecards. 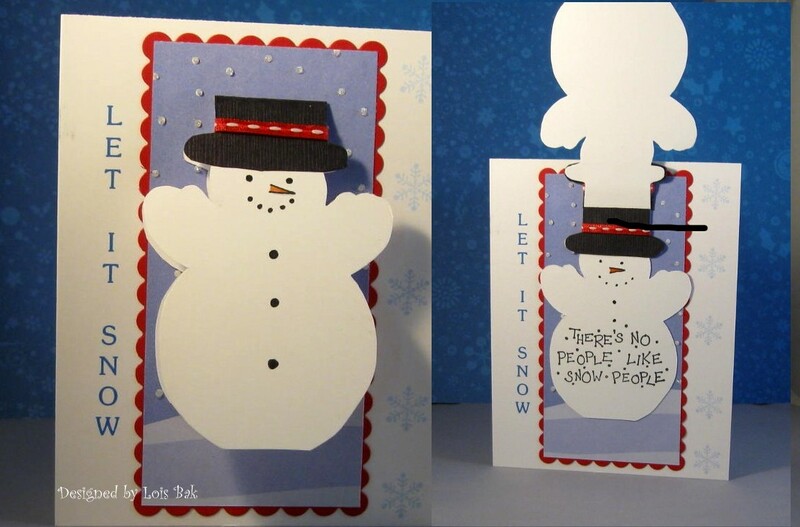 My snowman is 2 3/4" x 3 7/8" -- so I just used him as part of a bigger card. After cutting out the template, I glued him onto a piece of DP and mounted that on the red scallop diecut. I cut out a hat, added the ribbon band, and drew in his face and coal buttons. There's not a whole lot of stamping on this card -- just the snowflakes down the right side and the sentiment on the inside. The outside sentiment was computer-generated, and I added a little sparkle to the falling snow with Viva Glitter-liner.